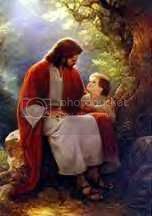 Some days, I seriously wonder what Christ was thinking when he told us to be like "little ones" to enter His kingdom. The way my kids get on each other's nerves (often on purpose), forget their manners, and assorted and sundry other things makes me wonder exactly what there is to model. My son showed me a way he is SO much more like Jesus than I am. I pray I can have the faith, love, and understanding of Andrew when I "grow up" in Him. My son was praying on Christmas morning, before anyone but the two of us were awake. Just because (how often do YOU do that? In my case, certainly not as often as He'd like). From a heart full of gratitude. I love all the presents I got on Christmas Eve, Jesus, but I love You more. That's an amazing thought from an 8-year-old, don't you think? And just the kind of thought Jesus loves to hear. We are to seek Him first. (Matthew 6:33)To love the Lord with all our heart, soul, mind, and strength (Deuteronomy 6:5). What are you basking in today - the wonderful gifts you received from family and friends, or the indescribable gift of God's salvation(2 Corinthians 9:15), and the incredible grace and mercy made possible by the Word becoming flesh (John 1:14), dwelling among us, dying for our sins, and rising again (1 Corinthians 15:3-4)? Yes - I love my new Christmas socks, the gift cards I got from assorted folks, and the other presents I received - including fellowship with family, good food, and the joy of watching others love their gifts. And, a few times, I'm not sure I could echo my son's sentiments. I was way too caught up in the pride of my own heart and my selfishness to remember that God is sovereign, and that every good and perfect gift comes NOT from man (or woman! ), but from God himself. Heavenly Father, help me to remember the lesson You taught me through my son. I want my love for You to be greater than any other love I may have: whether for people, places, or things. Help me to honestly pledge, as Andrew did, my love for You above all else. In Jesus' Name I pray. Amen. You're an amazing wife and mom, Jo. Where do you really think Andrew got his desire to love God and his attitude to be thankful. And where did he first hear the story that became the foundation of his faith? Thanks for sharing - we all have much to learn. I admire your accomplishments and how you transparently open your heart to share what you've experienced. Ahh..."unless you become like one these, ye shall not enter the kingdom of heaven" ...so much simple faith and love!